Before a single word is spoken, There Will Be Blood has you. During the first few moments of the film, we are presented with a speechless montage of clips that establish the severe power of what is to come. Much of this is due to the blazingly cryptic musical score, sending chills up our spines, demanding our attention. But most of all, these beautiful opening shots serve to introduce a character that will forever stay etched into our brains. This, is Daniel Plainview. In There Will Be Blood, writer-director Paul Thomas Anderson creates a brand new style that we never knew he had from watching his previous masterworks, Boogie Nights, Magnolia, and Punch-Drunk Love. In the turn of the century, Plainview goes from town to town, convincing its residents to let him drill for oil there. He goes in, sets up shop and benefits largely. His sales pitch is flawless and direct, using his young son H.W. as a selling tool. He is charismatic, charming, sincere and completely ruthless. After Plainview is visited by a young man who offers him information about oil in a town, Plainview moves across state and begins his system. He buys up all the land he can, begins drilling and soon hits oil. But no one stays on top forever. Soon Plainview begins to feud with members of the local church, and he is forced to come to terms with a tragedy very close to him. His perfect, flawless life is stopped dead in its tracks. Everything is put to a halt, and so begins his brutal plunge into lunacy. Daniel Day-Lewis is one of the best actors to ever be on screen. His intensity is unmatched. 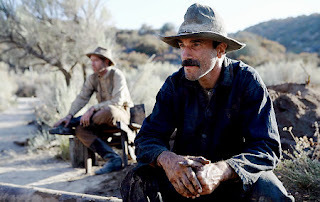 Watching There Will Be Blood, you will not for a second think that this is the same man who won an Oscar for My Left Foot, or haunted audiences with his emotional reverence in The Name of the Father, or most recently owned the streets of the Five Points in Gangs of New York. Day-Lewis isn’t himself playing Daniel Plainview, he is Daniel Plainview. This is the best work he has ever done. Not since Taxi Driver has a film and actor captured one man’s slow descent into the madness of his own mind. Paul Dano (the silent kid from Little Miss Sunshine) will floor you as an evangelical preacher who uses his sermons like weapons of mass deliberation. Don’t be fooled by his soft face and gentle features, Dano is a real player, going toe to toe with Day-Lewis where so many other actors have failed to do so. The film is filled with remarkable supporting turns, namely the young H.W. played by first time actor, Dillon Freasier. Freasier is incredible at matching Day-Lewis’ silence for thought, especially when his character hits a new emotional arch. Anderson has taken all the best parts from Upton Sinclair’s novel Oil! and molded it into a deeply personal and affecting film. Radiohead front man, Jonny Greenwood provides the miraculous, pulse-pounding music that is unlike anything you’ve ever heard. Greenwood fuses in sounds reminiscent to 2001 and Psycho while remaining inexplicably original. Likewise for Robert Elswit’s bold cinematography, which proves that his ability to film in long takes is damn near unmatched by anyone else in the industry. Where Children and Men and Atonement have been accused of using special effects tricks, Elswit leaves the technical crap behind, letting Anderson’s words play out in their respected way. Each scene of this film is a flawless, majestic work of art with equal parts camera work, music, acting, writing and directing. The fact that it has come so late in the year and is already receiving such high accolades proves that American audiences are ready for something real, something intense, something monumental. Who is the worse villian? Daniel Plainview of the Preacher. This is one of those movies that I cannot forget....and that I keep thinking about. Excellent review. That is a great question, Plainview is the obvious answer, but when you look deeper, they are both (dare I say equally) villainous. Best flick I've seen this year. Clearly, the best portrayal of what it's like to work in the oil and gas industry. Even though it is nearly 100 years ago, it is a cut throat, very laborious indistry to say the least. I couldn't agree more. I'm really glad you liked the film, and that you are enjoying the site, it means a lot.